The dialogue occurred in commemoration of United Nations General Assembly Resolution A/65/PV.34 of 20 October 2010, which established the ‘World Interfaith Harmony Week’ and designated the first week of February of very year as the time for its commemoration. The dialogue was aimed at discussing the importance of faith to promote peace and the role of faith-based organizations in fostering development as a means to maintain peace. The discussion at the event also recognized the important role that the Secretary-General’s Plan of Action to Prevent Violent Extremism will have in the discussion of faith and peace-building and in the joint efforts of adherents of different religions in the prevention of violent acts that lead to terrorism. The event was composed of two panel discussions and began with Mr. Francesco Pisano, Chief of the UNOG Library, opening the dialogue by sharing welcome remarks on behalf of the United Nations in Geneva to the 130 audience members. The first panel allowed the sharing of perspectives on faith and peacebuilding, and included statements by H.E. Saja Majali, Permanent Representative of the Hashemite Kingdom of Jordan to UNOG, H.E. Archbishop Silvano Tomasi, Apostolic Nuncio and Permanent Observer of the Holy See in Geneva, and H.E. Silmane Chikh, Permanent Observer of the Organization of Islamic Cooperation in Geneva. The second panel explored the theme of faith and development, and included the perspectives of Mr. Alex Mejia, Officer in Charge of the United Nations Institute for Training and Research, Ms. Beris Gwznne, former Director of World Vision International in Geneva, and H.E. Marie- Thèrése Pictet-Althann, Permanent Observer of the Sovereign Military Order of Malta to UNOG. Each session closed with a Q&A session in which the audience asked questions of the panelists. At the end of the event, H.E. 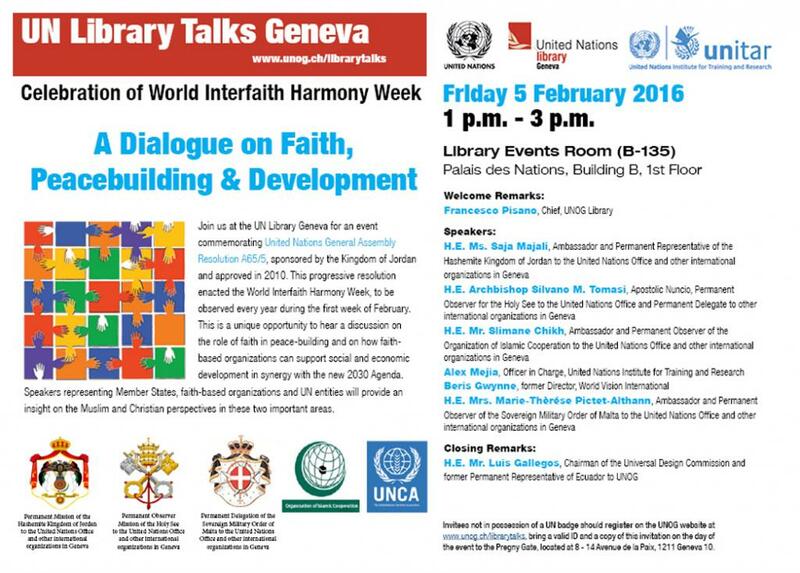 Luis Gallegos, Chairman of the Universal Design Commission and former Permanent Representative of Ecuador to UNOG, read the document, “A Statement Promoting Interfaith Dialogue and Embracing the Interfaith Harmony Week.” The statement emphasized the common humanity that binds the peoples of the world together, and the role of harmonious relations and understanding between adherents of the world’s religions in achieving true peace and reconciliation in the world. Additionally, the statement expressed the commitment of participants of the initiative to promote interfaith dialogue and to denounce violent extremism, and called upon all Member States of the United Nations to join efforts in spreading the message of interfaith harmony, mutual understanding and good will to combat violent extremism. This event was co-organized by the Missions of Jordan, the Holy See, and the Order of Malta, the Delegation of the Organization of Islamic Cooperation, and the United Nations Christian Association (UNCA). For the flyer with invitation, please click here. For the event agenda, please click here.